Carlisle-based former jump jockey , Liam Cooper, now a fully qualified Farrier, has taken the Injured Jockeys Fund Progress Award 2010. This award is one of two Griffins Richard Davis Awards which are made by the Jockeys Employment and Training Scheme (JETS) to recognise the effort, initiative and forethought which jockeys and former jockeys put into developing new careers after race riding. 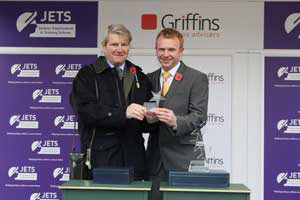 Liam received his award on Sunday 14 November at Cheltenham in an official presentation in the paddock before racing. Injured Jockeys Fund Trustee and former racehorse trainer, Ian Balding, presented Liam with his trophy and £2,000 prize, having been judged as the jockey to have made the most progress in their career development over the past year. Having ridden 182 winners over jumps (many for Jonjo O’Neill) -and most notably being associated with the horse, Intersky Falcon - Liam had his race riding career cut short in 2004 by serious injuries and recurrent concussion . He turned to JETS for guidance on how to become a farrier, his second choice of career - the training for which is extremely rigorous and takes a minimum of four years to qualify. “Liam’s application was impressive because it shows that, with hard work and the right sort of help, jockeys can come back from serious injuries to shine in other spheres. We very much see it as one of our roles at the IJF to ensure the long-term well being and self-sufficiency of jockeys once they retire and wish Liam every success in his next goal to become an approved training farrier,” comments Lisa Hancock, judge and Chief Executive of The Injured Jockeys Fund. “I have enjoyed every bit of my apprenticeship and am hoping to concentrate on racing yards in the Carlisle area where I can put my jockey experience to good use. Being self employed, this award will enable me to invest in my business for the future,” adds Liam. “Liam is a shining example of the talent jockeys, as a group, now present to employers. Jockeys are so much better equipped for life after race riding than they used to be and the result is that they are more confident about making the transition, getting braver in their second career choices and have better prospects. We would love to speak to more businesses out there (both in and outside racing) who could use our services and benefit from the talent we now have on our books,” explains JETS General Manager and Career Coach, Lisa Delany.